Zulu Alpha (Street Cry) wins the Sycamore Stakes (G3) at Keeneland on 10.18.2018. Zulu Alpha's decisive stretch run in the Grade 3 Sycamore Stakes Thursday wasn't only his first career graded win — it was also the first for trainer John Alexander Ortiz. The flashy 5-year-old gray gelding, piloted by Channing Hill, tracked the early pace and took a rail trip through the turn to take over the lead at the top of the stretch, and drew away by two lengths at the wire. Favored Arklow finished second, just in front of rival Bigger Picture. Early leader Final Copy faded to fourth. Zulu Alpha came to the Sycamore off a hot streak that saw him first or second in his previous three starts. His resume also includes a third-place finish in the G2 Muniz Memorial Handicap earlier this year at Fair Grounds. Ortiz claimed the gelding out of his most recent start, an allowance optional claiming race at Churchill. Ortiz trains Zulu Alpha for Michael M. Hui. Calumet Farm bred the son of Street Cry (IRE), who is out of A.P. Indy mare Zori. The final time for the 1 1/2 miles on good turf was 2:34.21. Zulu Alpha paid $16.20 to win. “Obviously there was a little concern because (Arklow is) the favorite, he's the horse to beat. I was happy my horse got a little cover first time down the lane. Then when he (Zulu Alpha) pressed the pace, it was either am I going to fight him to stay in this bad spot or am I gonna put him inside? The way he ran at Churchill last time (winning a 1 1/16-mile allowance race on turf Sept. 14), obviously he enjoys coming through (along) the fence. 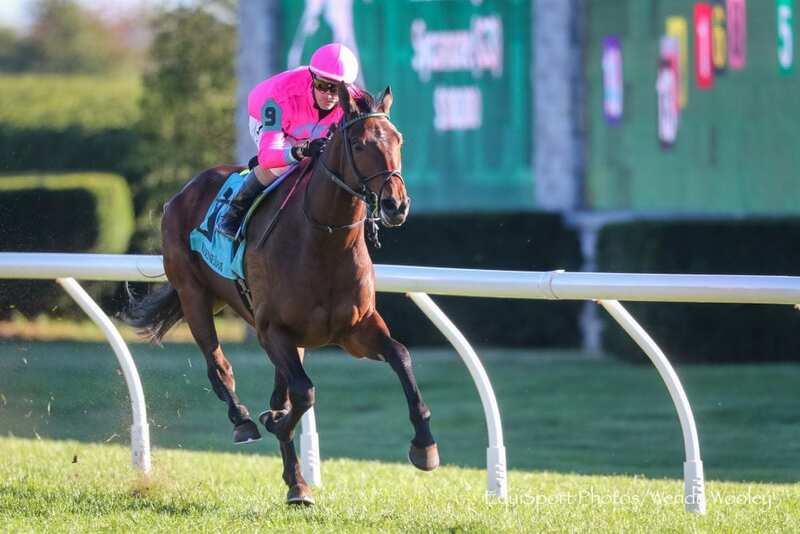 This entry was posted in NL List, Racing, Videos and tagged Calumet Farm, channing hill, John Ortiz, Keeneland, michael hui, Sycamore Stakes, zulu alpha by Paulick Report Staff. Bookmark the permalink.